I’m a symbol of the human ability to supress the selfish and hateful tendencies that rule the greater part of our lives. 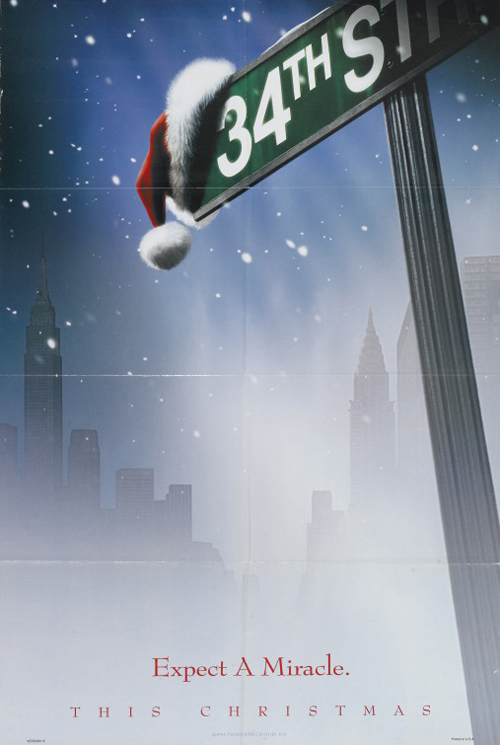 (SPOILERS) There are sentiments in the original Miracle on 34th Street, but it isn’t weighed down with sentiment, and it has a “serious” message amid the wit and frivolity, but it isn’t overburdened by it. There’s a romance, but it’s breezy rather than stodgy, and there’s an obligatory cute kid, but she isn’t horribly precocious. 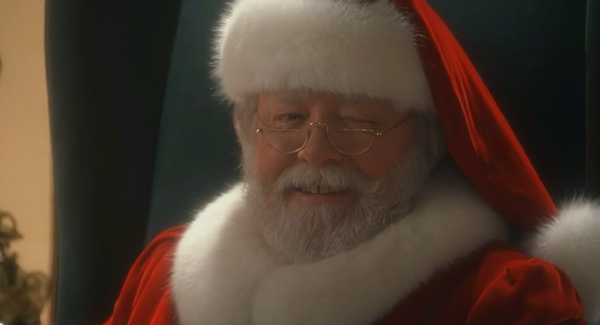 And, of course, Santa Claus features, but he isn’t impossibly twinkly and ineffectual. In short, Les Mayfield’s remake makes heavy weather of everything that was sharp and inspired about the 1947 movie, and shoots the whole thing through a nightmarish soft-focus gauze designed to add to the viewer’s distress. It’s also a good twenty minutes longer, and boy, does it feel it. You have to wonder what happened to John Hughes post-Home Alone, as he seemed to entirely lose his creative mojo, content to act as writer-producer on mostly weak/unnecessary adaptations or remakes (Dennis the Menace, 101 Dalmatians, Flubber, Just Visiting). 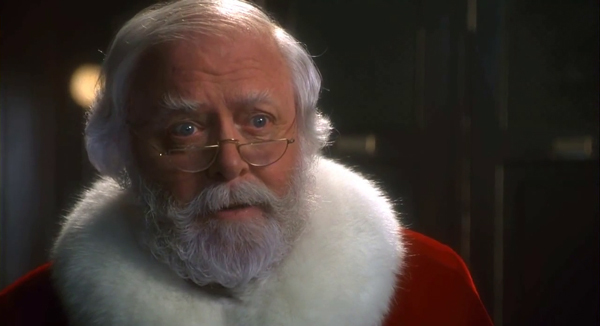 The only reason to redo Miracle is if you can somehow put a different spin on it, rather than basing the project – seemingly – on how much Sir Dickie resembles like a Coke bottle Saint Nick. Which simply isn’t enough. Attenborough lends no weight to the role, even when enraged. He could do with a bit of 10 Rillington Place to punch up his 34th Street. Less than a decade earlier, Hughes was still churning out screenplays filled with pep and vibrancy, but he seems intent on ensuring Miracle is as flaccid and congested as possible. Most of the principle plot points are the same, but they sprawl by ambivalently. 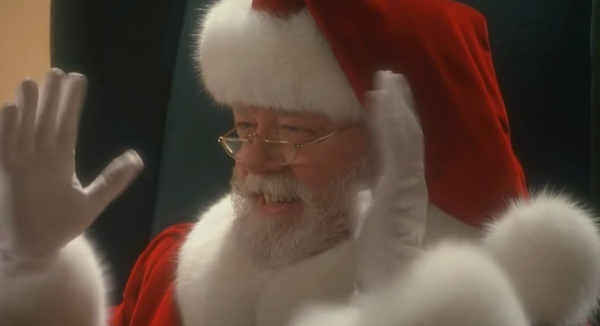 Instead of a shrink leading Krisk Kringle into the courtroom, it’s a put-up by evil Joss Ackland (always evil, since Lethal Weapon 2, but barely in the thing –this is the kind a movie that now needs an obvious villain to work, apparently) inducing an inebriate “fake” Santa (Jack McGee) to cause an altercation leading to Kris winding up in court and likely to be put away when the judge (Robert Prosky) rules there is no Santa Claus. 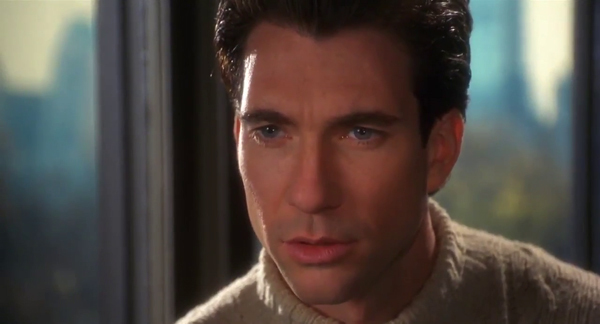 As before, Kris is defended by a hotshot lawyer (Dylan McDermott), and as before (but more sickly-sweet in its foregrounding and emphasis on faith) he’s got a thing for the mother (Elizabeth Perkins) who has persuaded Kris to fill in as Santa. 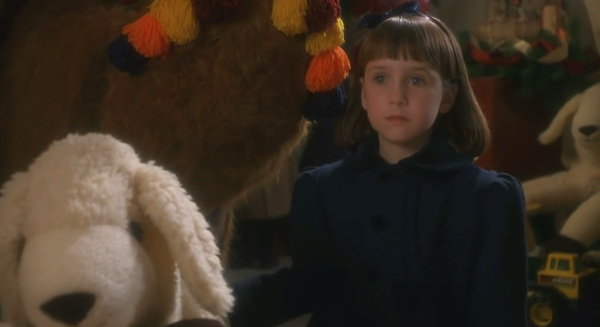 Did I mention that the kid (Mara Wilson, of Matilda) – the one brought up not to buy into Santa fakery – is all kinds of wrong? Smug and preternaturally confident as only Hollywood brats can be, so you never really believe in Susan becoming a true believer. Meanwhile, Perkins is no Maureen O’Hara – she lacks that warmth – so all you can really see in Dorey is her draconian parenting. You certainly won’t be able to fathom why McDermott’s interested. He’s okay, but doesn’t lend Bryan the sense of fun John Payne brought to the equivalent role in the original (I had in mind that McDermott was a frequent love interest in such movies, but I’m probably thinking of Dermot Mulroney). That’s the problem with this all over. It ups the treacle at the expense of the wit. Even the court scenes, surely an easy victory, rather fall down, as Bryan’s evidence uses some of the same ideas as before but misses out on the broader, crowd-pleasing element. JT Walsh is as great as ever he was as the prosecution lawyer, particularly exasperated when his wife is called to testify that he told their daughter Santa existed, but Hughes undoes his case resting – as per the original – when Walsh’s Collins puts in a bid to prove Santa doesn’t exist (involving the history of Saint Nick, a colonel who explored the North Pole, and a reindeer that won’t fly). Kris offers fey, anodyne responses (his workshops are invisible – and bizarrely, “They’re in the dream world” – and his reindeer fly only on Christmas Eve). Additionally, it’s the judge who now delivers the get-out-of-jail-free speech (as a result, the playing with the consumerism/popularity angle in avoiding proclaiming Santa as a fake is far less lively and provocative), flourishing a dollar bill issued by the Treasury bearing the words “In God We Trust”, and observing it refers to “a being just as invisible and just as present”, which is somehow much less satisfying in its equivocal philosophical appeasement than the original’s US Postal Service. 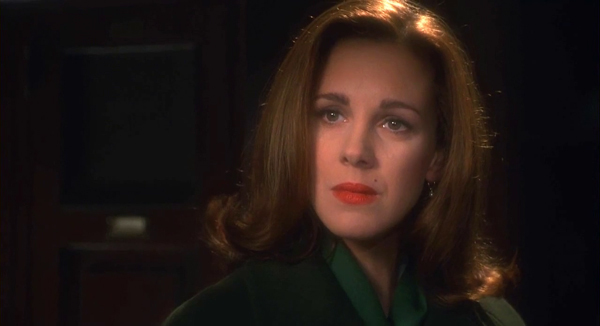 Other faces popping up include James Remar, Jane Leeves, Mary McCormack, Allison Janney, and most surprisingly, and pleasingly, Arthur Dent himself, Simon Jones (he evidently had an agent attempting to get him US work in the ‘90s). 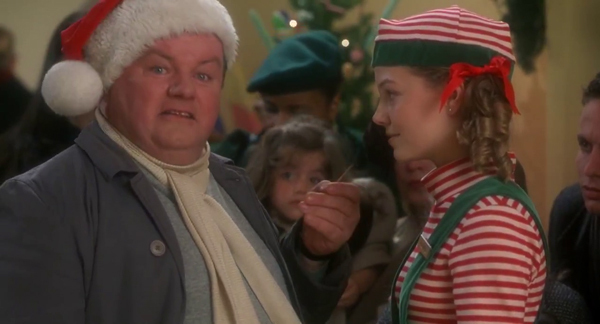 I wouldn’t go as far as suggesting this Miracle on 34th Street is a terrible movie, but it’s bereft of any reason to be, sitting unwanted under the tree a week after the big day. It somehow manages to be less relevant fifty years after the original and is rightly regarded as its footnote (although, some will no doubt pick this one over the first as it’s in colour, with an even happier ending).